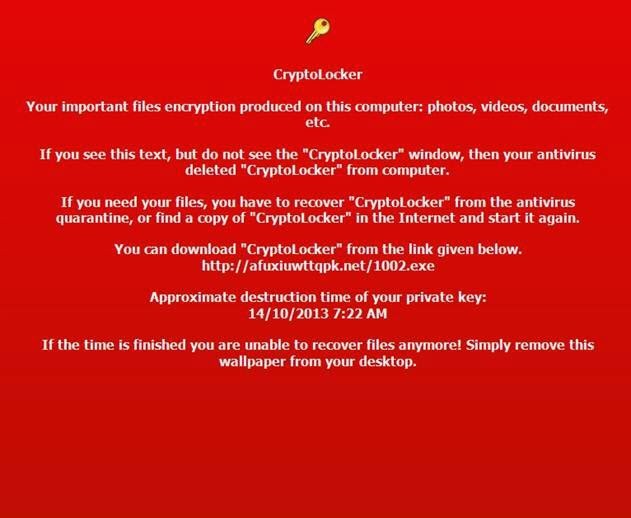 It has come to our attention that a virus called “Cryptolocker” is currently infecting computers, and it is worse than anything that we have seen before. It is bypassing antivirus software and encrypting office and PDF files. This has been created as a form of ransom-ware; in which the creator sells the key to the encrypted files to infected users. We advise taking extra precautions when opening email attachments. We also advise not to use peer-to-peer network programs like Bit Torrent. Be very careful of the websites you go to. The virus can be transmitted three ways. 2. Through peer-to-peer sharing networks. Because you would be connected to many machines across the internet which may or may not be secure, the virus can happily transfer itself through this network connection. 3. Through a weblink that has been modified. This is rare as most sites are fairly secure, but smaller sites or illegitimate sites can host this infection. It is our recommendation that all machines are updated to the latest patches from Microsoft and a decent antivirus software running the latest virus definitions. It is recommended that you install Malwarebytes. This program allows scanning of all files coming in and out of the network and does prevent most infections. None of these, however, will keep you 100% secure from this threat, but will minimise the risk. We are also recommending that people make a separate backup to an external device (USB or Cloud) and keep this offsite to minimise data loss if you do get infected.